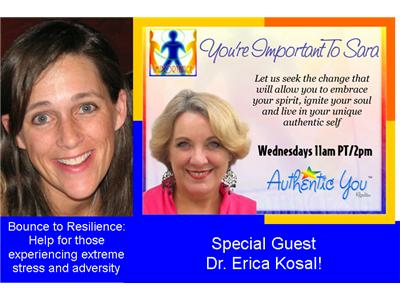 This week on You're Important To Sara we will be speaking about overcoming something Erica knows all to well. Erica blogs for Traveling Troubled Times, where she writes about her experiences with raising two children, caring for her ill husband, and juggling a full-time career. She and her husband also maintain a website, Bounce to Resilience, which can be found at http://www.bouncetoresilience.com and is designed to provide help to people experiencing extreme stress and adversity. Dr. Kosal is also a public speaker inspiring people to take control of their own situation by adopting resilient strategies and is the author of the forthcoming book: Miracles for Daddy: A Family’s Inspirational Fight against A Modern Medical Goliath due out in November .